If you’ve been looking for a health(ier) treat that packs in extra nutrition from fruits and veggies, look no further. What’s more fun than a sweet treat of cookie dough out of the fridge? 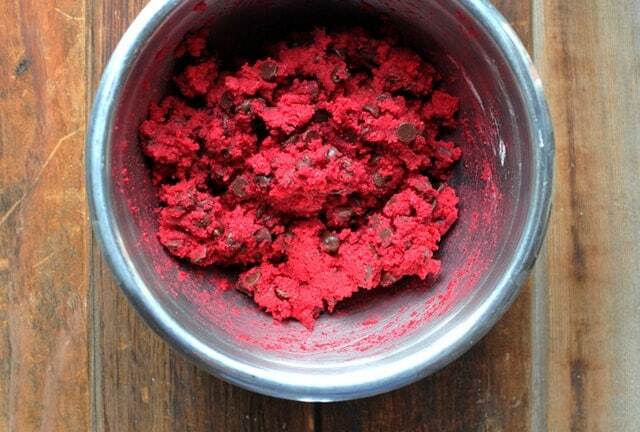 PINK cookie dough out of the fridge. Of course, it’s naturally pink, no dyes here. 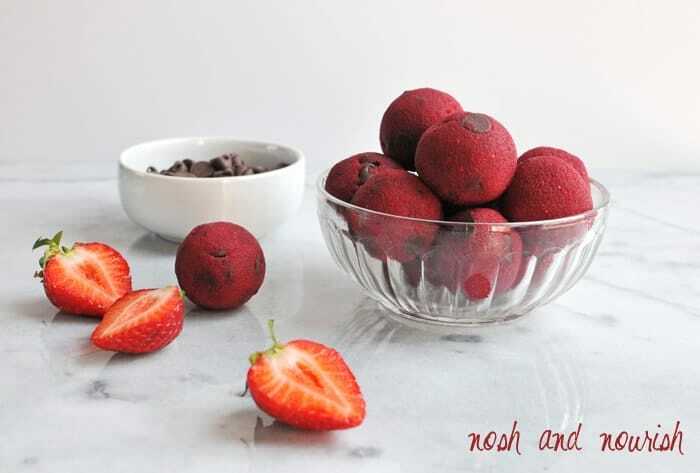 Roasted beets + strawberries gives the dough its gorgeous pink color! This dessert is egg-free, so you can eat the dough raw without hesitation. It’s also gluten-free and grain-free, as I used a combination of almond flour and coconut flour. Beets are one of those foods that most people either love or hate. 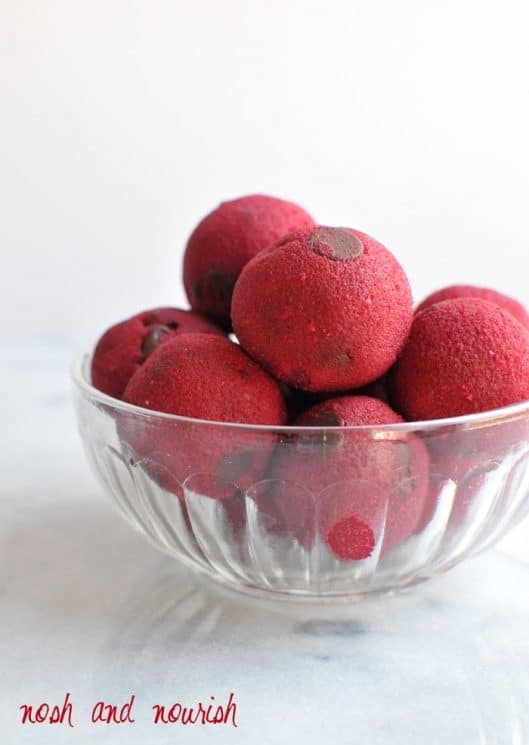 They can have a distinctive taste (ehem, my hubby thinks they taste like dirt), but you can minimize this by doing a few simple things: 1) make sure you peel the beets completely and 2) roast them with a dollop of coconut oil. First, you roast the beet with a teaspoon of coconut oil. 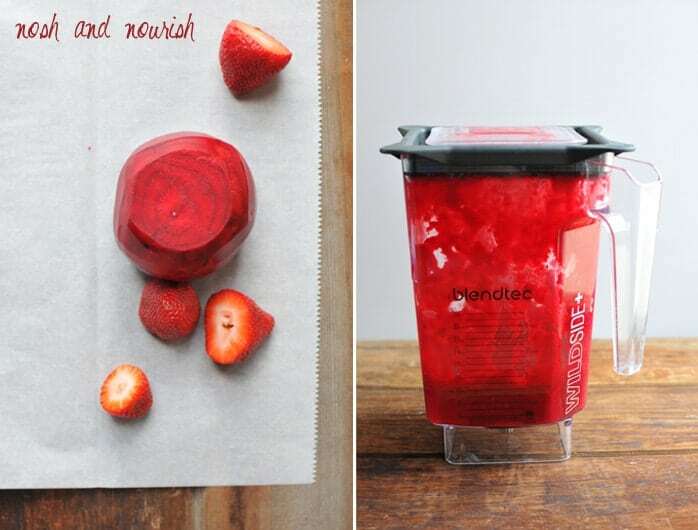 Then, add the strawberries, cooled roasted beet, coconut sugar, vanilla extract, organic strawberry jam (be sure to look for one without any high fructose corn syrup), and olive oil to a high powered blender — or a food processor will work. Blend until smooth. Then mix in your dry ingredients: almond flour, coconut flour, sea salt, and chocolate chips to form the dough. Put the dough in the fridge for 30 minutes, then take it out and roll into 1.5 inch balls. 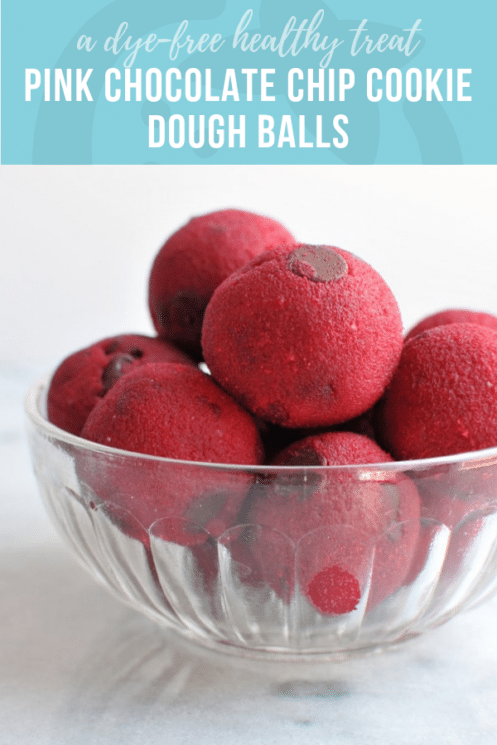 The dough balls store really nicely in the freezer and you can grab one (or two!) whenever you want something sweet. We’ve made these 3 times in as many weeks, and everyone absolutely loves them: Babycakes, her teachers, her friends, and even her beet-hating daddy. 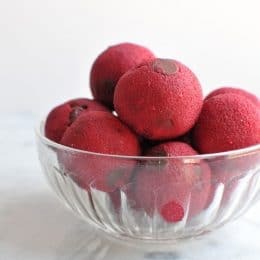 So if you don’t think you like beets, you should definitely try this recipe… and surprise yourself with how good they are! Beets are a good source of folate and manganese — improving brain function. 1 beet has more potassium than a banana. The bright red pigment of beets, called betalains, provide anti-inflammatory and detoxification support of the body. We also love beets because they aren’t expensive, are one of the sweetest vegetables, and are super versatile. Kelly is the author, recipe creator, and food photographer behind the blog Nosh and Nourish. She incorporates nourishing superfoods into every meal for her husband, adorable toddler, and herself (think quinoa, Greek yogurt, chickpeas, kale, blueberries, etc..) and manages to keep everything tasting absolutely delicious! She is also the author of the cookbook Superfoods at Every Meal, on shelves now. When not creating new recipes or taking pictures of them, she can be found exploring the Rocky mountains, gardening, hiking, or fly-fishing. Cut off the beet bulb and peel it. Your hands WILL get pink! Put the beet in a baking dish and top it with 1 tsp of coconut oil. Roast it in the oven for 45 minutes, then let it cool. You can speed up the cooling process by putting it in the fridge or even the freezer for a few minutes. Combine the roasted beet, the strawberries, the organic strawberry jam, the coconut sugar, olive oil, and the vanilla extract in a high powered blender. Blend until smooth. Pour the mixture into a medium mixing bowl. Put the dough in the fridge for 30 minutes, then take it out and roll 1.5 inch balls. I read the recipe several times, and I don’t see where you add the tbsp. of olive oil? Should it have been listed to go in the blender with the beets, strawberries, etc? I see that the coconut oil was for roasting the beet, but was the olive oil just forgotten??? Thanks in advance. Jane — Sorry about any confusion! Yes, you should add the olive oil into the blender. I had it written in the blogpost itself, but forgot it in the written recipe. What other flours can you substitute for almond and coconut? Sarah – you can sub pretty much any flour you want. I also made a batch with whole wheat pastry flour, and they still tasted great! Hi, I have used only Almond Flour (no Coconut Flour), but could not make balls as mixture was too wet. What shell I do in this case? You just keep adding almond flour, 1/4 cup at a time until the desired consistency/dryness is achieved. I also refrigerated it for an hour so that it would dry out a bit before making into balls. 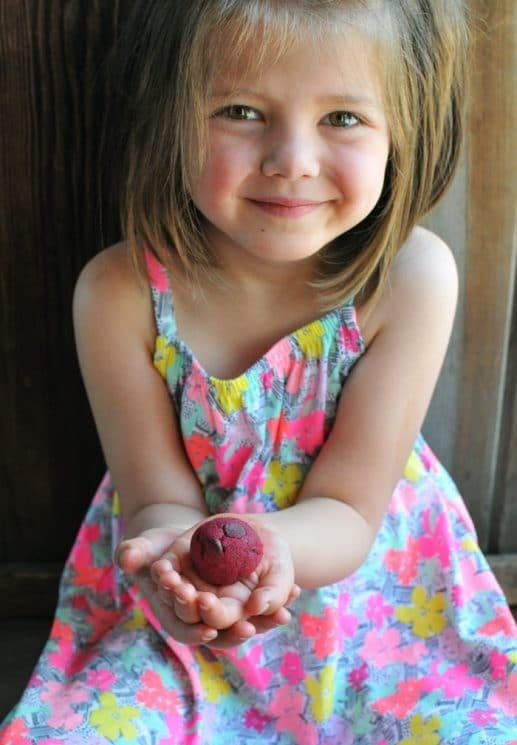 I know your hands will turn pink while peeling the beets but will they also get pink from the finished product? Thanks! Not really! Once it’s mixed in with everything else, it doesn’t really get your hands messy. How many dough balls does this make? Sounds amazing! How large of a beet do you recommend? I have smaller organic beets and just wondering if I should use two-three of those.